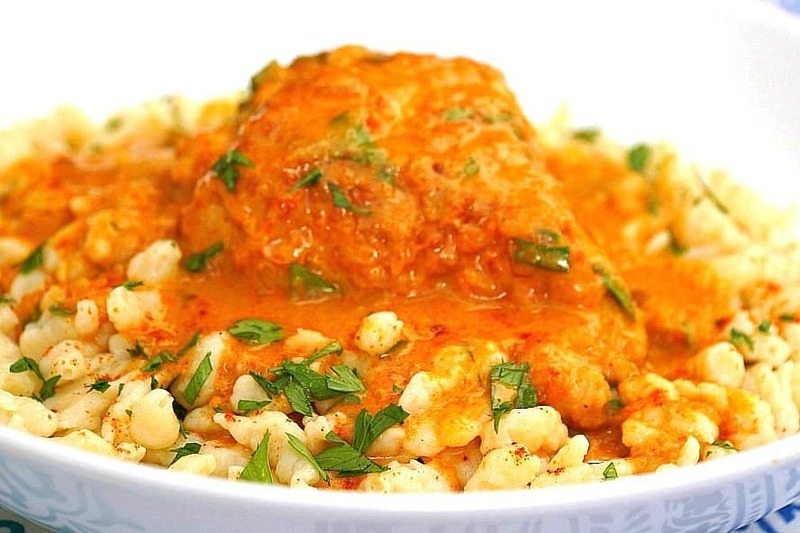 This Chicken Paprikash Recipe is a staple dish in Hungary. Make sure to use the freshest Hungarian Sweet Paprika you can find in order to get the full authentic flavor of this dish. 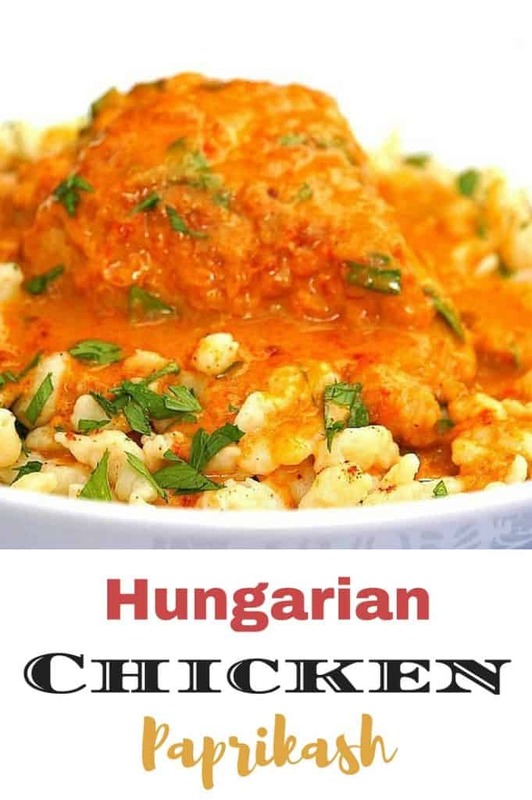 One taste and you’ll understand why this is a favorite dish in Hungary – classic comfort food at it’s finest! Add 2 Tablespoons of flour to a plastic bag with a pinch of salt and pepper. Place chicken pieces in the bag and shake until coated. Remove them from the bag and shake off excess. Heat vegetable oil (not olive) in a frying pan. Add the chicken cook until golden brown on each side. Add enough Vegetable Oil to coat the bottom of a dutch oven and put it over medium heat. Add the minced onion and cook until it translucent. Add garlic, paprika, and red peppers and cook for 3 minutes, stirring frequently to avoid burning the paprika. Add the tomato paste, chicken and chicken broth (there should be enough to just cover the chicken. Simmer for 25 minutes until the chicken is cooked through. Combine the sour cream with 1 tablespoons of flour in a bowl. Add about 1 cup of liquid from the hot mixture to the sour cream in order to warm it slightly. Add slowly into the dutch oven and continue cooking for 10 minutes. 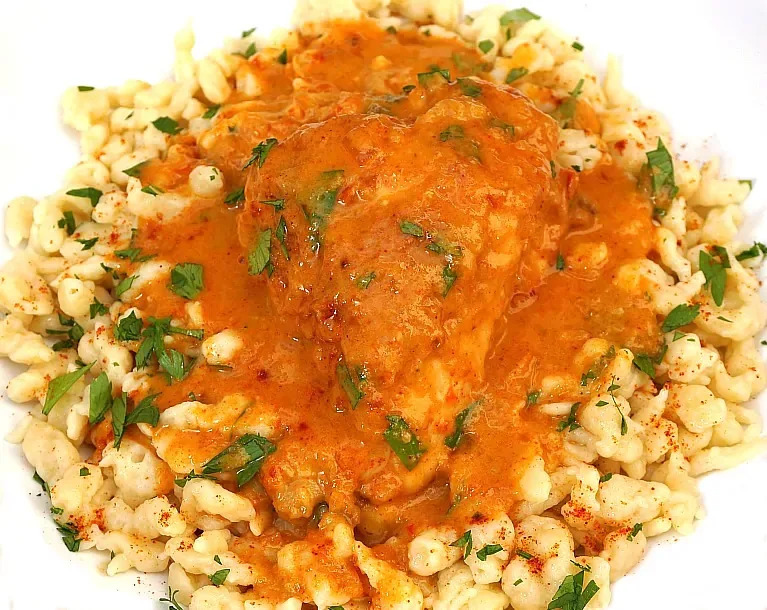 Serve over egg noodles or, if you are more adventurous, try making these easy Hungarian Dumplings (Nokedli). Garnish with parsley and serve with a side of sour cream and Hungarian hot paprika sauce (Eros Pista) or other spicy hot pepper sauce of your choice. Visit our International Recipes section to view our collection of international recipes (including additional Eastern European recipes), inspired by our ongoing travels around the world. This looks like a dish my friend makes, and it’s really very good. I used this recipe and it turned out amazing! The only things I did differently are that I added another clove of garlic and used chicken breast. I also did 2 tablespoons of sweet Hungarian paprika, and 1 tablespoon of sweet smoked paprika. But these are personal preferences. So glad it turned out well for you and thanks for letting me know! I’m making this again right now because my family has been asking for it since the first time I made it! Thanks for a great recipe. This is the third time I have made this recipe since I discovered it in June. Love it! My Aunt Margaret made this when I was younger. I have been searching for this for yesrs. Thank you. My quest has ended. I love it! 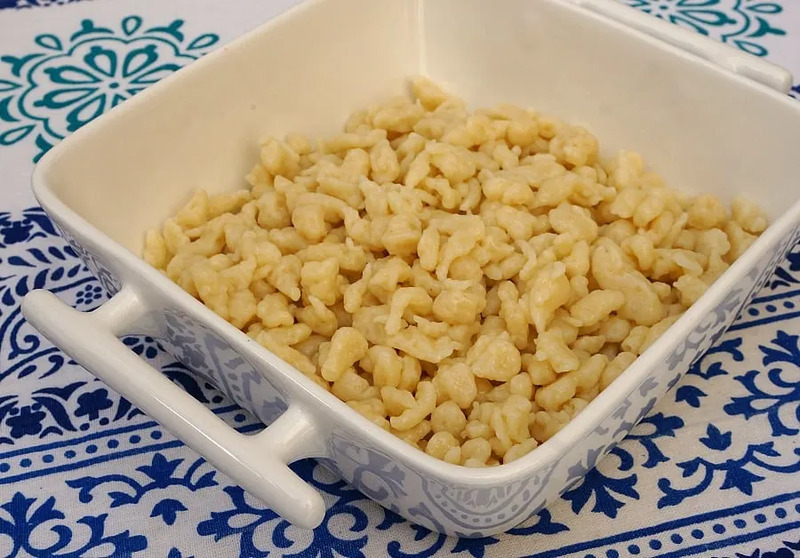 This is an excellent recipe I continue to use as my base. I add an additional tablespoon of paprika, half a teaspoon of caraway speeds, carrots and celery to make it hardy and more Hungarian. Actually the recipe is for skin on chicken. I have not tried to make it without skin but would be curious how it turns out. I think the results would still be very good. As much as I enjoyed this I think it might be even better the next day when all the flavors meld together. Was very yummy,my whole family loved it!